PaperCut KB | I'm new to PaperCut Administration - what do I need to know? I'm new to PaperCut Administration - what do I need to know? KB Home | I'm new to PaperCut Administration - what do I need to know? PaperCut helps organizations keep track of who’s printing what, by monitoring the print queues and the print jobs going through them. There are two related products - PaperCut NG (which tracks and controls printing) and PaperCut MF (additionally tracks copying/faxing/scanning on Multi Function devices, by installing a small PaperCut app on the MFD itself). There’s a little more information about PaperCut in general over on the Tour Page. Check out more site layout diagrams. 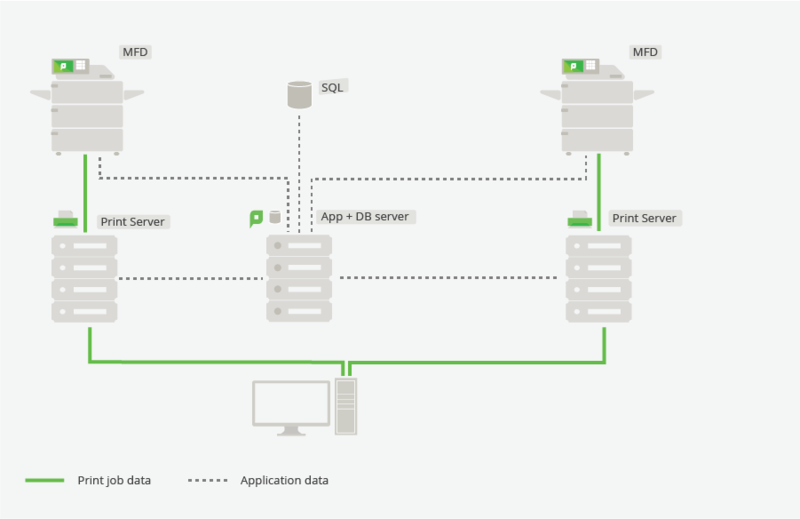 Application Server - the ‘brains’ of the operation - running under the ‘PaperCut Application Server’ service, this process is responsible for the admin and user web interfaces, as well as controlling and tracking user balances, print job information, allowing/disallowing jobs etc. Take a look through the installation page if you’d like more information on the App Server installation. Secondary server / Print Provider - this is the small agent that sits on any print servers, and monitors the local print queues. PaperCut monitors the ‘last hop’ before the printer - so if you have a print server setup, PaperCut will be installed on that print server, and the Print Provider will examine the print jobs going through the queue. The print provider then lets the Application Server know details like ‘tim is printing a 3 page job, 2 pages are color and 1 is grayscale’. The Application Server then checks if ‘tim’ has enough balance / is allowed to print to that printer etc, and will tell the Print Provider to either let the job through or deny it. There’s a handy guide to installing the secondary server for a more detailed view. Client - some customers use the PaperCut client, however it’s not necessarily required. Check out the Client Install pages for more information on the client installation, but customers may be using this for authentication, or for e.g. selecting a project/client to charge the print job to. To actually track the job, in a simple configuration PaperCut is looking at the OS level owner of the job in the print queue - there’s some great screenshots and description over on Print Jobs not getting tracked by PaperCut, but in short, if the owner name of the job in the e.g. Windows print queue is ‘megan’ then we will track the job against Megan’s account in paperCut. How do I get access to the PaperCut Application Server / Admin Console? PaperCut has a main administration interface that can be accessed through a browser. If you’re on the server running the PaperCut App Server, you can use http://localhost:9191/admin - or you can substitute your server IP address in the URL to access it from a workstation on the network. There’s more information on the How to Login to PaperCut knowledgebase article. If you get to the login screen but no one left you the login credentials, you can get access to the system as long as you have access to the file system on the PaperCut server, by Resetting the Admin Password. Is there a test environment that I can play with? If you’re wanting to get familiar with PaperCut, but understandably not wanting to play with your production environment, you can head over to the Live Demo site, where you can see features included in the product, and run test reports etc. The other option is that you can download the free 40-day trial version, to a test computer, and then test out the system / test out potential changes that you are wanting to make, before making them in production. You can download the trial version here. PaperCut Ports - if you’re used to using other Print Management systems, then you may be used to having to use a specific port for setting up new printers on the print server. With PaperCut, that’s actually not the case. When setting up new printers, you will see a PaperCut Port listed, however most of the time it’s actually preferable to use the standard TCP/IP port. The only time that you’d really want to use the PaperCut Port is if you’re using Hardware Checking - and even then, you’d want to make sure you’re only using the PaperCut port and hardware checking on any target queues, rather than any virtual queues. It’s also worth checking out the Setting up Windows Print Queues article for a checklist of items to make sure are completed when setting up new queues on the print server. Find me printing - is always a popular setup with PaperCut, so it’s worth taking a look through the Find me printing setup page to get familiar with that setup. In short, it allows users to print to a single virtual queue (which is basically just another print queue at the OS level, but it’s configured as a virtual queue in PaperCut) and then walk up to any MFD or printer, and release their print job on that device. There’s some common questions about Find-me printing too. Shared accounts - contrary to what you’d expect, the ‘Accounts’ tab in PaperCut is actually a list of Shared Accounts - these are projects / client codes / cost centers that users can charge to when they print. For example if you’re printing a document for the Space department, then you can use the PaperCut client to charge that job to the Space department. User/Group Sync - to avoid having to create all your users and groups manually, PaperCut can sync with your user directory source, and pull all the user/group information across as needed. Upgrading PaperCut - when it comes time to upgrade (or maybe you’ve inherited a super ancient version - a little known tip is that the version of PaperCut is tied to the year - so if you’re running version 17, you know it was released in 2017) it’s handy to get an overview of the upgrade process - normally very quick and easy - and all your current data will remain intact with the simple upgrade process. The PaperCut Knowledgebase is a fantastic place to start - you can pretty much search for anything, and it beats reading the entire PaperCut manual, cover to cover! It’s not only for our customers - in the support team we use the exact same KB all the time - anything that we find out that may be useful for our customers, we’ll put straight into the KB. If you didn’t find what you’re after there, you can always contact your local help resource. If you’re using PaperCut NG (head over to the ‘About’ tab in the PaperCut Admin Console to find out) then you can head over to the Support page, or create a Support case with us. If you’re using PaperCut MF, then you can do exactly the same - or if you’re looking for more personalized help, on the PaperCut MF ‘About’ page under the ‘Support’ section, you should see your local Reseller or Authorized Solution Center contact information. These are likely the teams that will have helped install, or remotely installed PaperCut at your site originally - so can give you a personalized support experience as they’ll know your specific system inside and out! It’s always handy to include your Support ID (from the ‘About’ tab in the Admin console) when contacting us - that lets us look up your license information, and will tell us a bunch of useful information about your setup - e.g. how many devices you’re licensed for, and which type, and how many users you’re licensed for, or if you’re eligible for free upgrades etc.